The Babaomby spot situated on Madagascar’s Emerald Sea lagoon gathers a beautiful and diverse playground for kitesurfers with excellent wind conditions. The spot is ranked among the ten windiest spots on the planet by Windguru and offers everything a kitesurfer dreams about: safe conditions in shallow and crystal clear waters, two wave zones easily accessible only a 15-minute ride away and a 500m long and 40cm deep flat zone over a white sandy bottom. The trade wind begins to blow strongly in April and continues until the end of November with 20 to 35 knots from 9 am until the sunset. With 98% of wind days above 20 knots, the wind statistics are mind-blowing. During the kitesurfing season, the average outside temperature is around 30° and the water temperature between 26° to 28°C. The lagoon is surrounded by a huge coral reef and numerous isolated paradise islets. It is 12kms long, 3kms wide and enjoys continuous onshore wind; the spot allows long and safe rides. Every week, the Babaomby Island Lodge organises downwind trips to “La Piscine”, the flattest spot of the lagoon with a lunch on the Nosy Antaly Be Islet. Two wave spots are also easily accessible for those who want to throw big jumps and ride the rollers. The easiest wave spot is located in front of Nosy Toreky Islet: you'll find 1 to 2 meters waves at low tide with a side onshore starboard wind. The longest and most renowned wave spot is located behind the Nosy Suarez Islet. A right with 1 to 3 meter high waves with a side shore starboard wind. Around the Babaomby spot, enjoyable hikes lead you to a Baobab forest, a mangrove river which you can ride in a wooden canoe or some beautiful Tsingy (typical rocks formation that you can find in Madagascar). Up in the north of Madagascar, around Diego Suarez, is full of National Parks and places to enjoy great sceneries and see tonnes of wildlife. 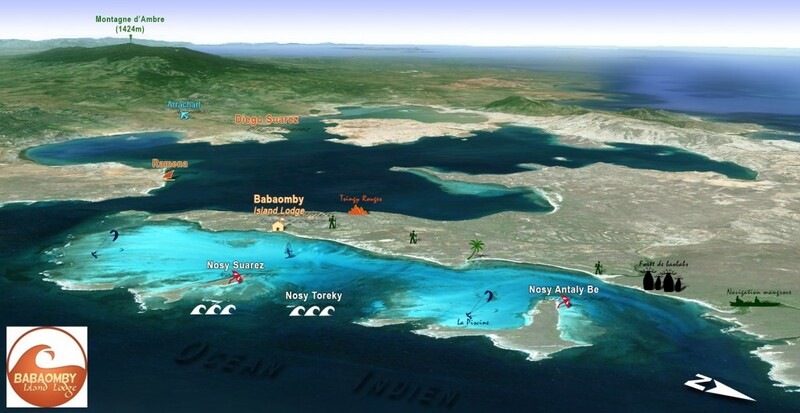 The closest airport to reach the Babaomby spot is located in Diego Suarez (Antsiranana). The Babaomby Island Lodge, our eco-lodge facing the spot on the shore of the lagoon, organises a pick up from the airport to the fishing village of Ramena, where our captain Patrick and his chief mate Jo will take you on our boat. After a 45min boat trip, you are in the heart of the Emerald sea lagoon, surrounded by kitesurfers and windsurfers riding over a crystal clear water! Founded by a Frenchman, the Babaomby Island Lodge has a strong reputation regarding its home restaurant. Every meal is homemade with fresh, local (sometimes straight from the veggie garden and most of the time straight from the lagoon) and seasonal ingredients. Furthermore, Richard, the chef, uses traditional equipment such as a Madagascar’s hoven to cook his delicious and acclaimed food. All meals are shared by the guests and the staff all together on a single large table, which makes it a very pleasant and special place. You will also find a bar in the Babaomby Island Lodge, next to the restaurant area, where all the kitesurfers and windsurfers come after their session and have a cold beer, a freshly made lemon juice, a fresh coke or any local cocktail they fancy. The nice atmosphere in the Lodge encourages everyone to gather every evening at the bar, to chill and listen to music while enjoying homemade rums and cocktails until it comes the time to reach your bungalows. At the Babaomby Island Lodge, you are encouraged to experience a break with your digital life! Still, a small WiFi connection is provided in dedicated spots. The Eco Lodge is built right on the spot, offering fantastic views of the Emerald Sea and yet is completely sheltered from the wind. The 14 bungalows are built on stilts with a traditional roof made out of leaves to protect it from heat. Each bungalow offers its private and shaded wooden deck on which the guests can relax and enjoy the view. Babaomby Island Lodge welcoming Charlotte Consorti! Maybe not so friendly locals! Ever passionate about windsurf, Nicolas Martin founded the Babaomby Island Lodge in 2008 after having discovered this amazing location whilst exploring the North of Madagascar with a team of pro riders and a camera crew, looking for the country’s best windsurfing spots. Amazed by this pure gem and its wind statistics, Nicolas decided to quit his Parisian life and 3 years later, his dream Lodge was built. As soon as the Babaomby Island Lodge was opened, it got selected by the F-One International team for its annual photo shoot and the shooting of its game changing video “Addikt”. After that, it didn’t take long for Babaomby to become renowned as one of the world’s best Kitesurfing spots! Been to Babaomby? What did you think? Where are the Best Kitesurfing Beaches in Babaomby? With the flat water lagoon protected by a huge coral reef with numerous isolated paradise islets on our doorstep, spanning 12km long and 3km wide, this is every kitesurfers dream. Ideal for windsurfers and kitesurfers of all levels, this spot is incredibly safe with its shallow, crystal clear waters. Every week, the lodge organises a downwind trip to "La Piscine", the flattest part of the lagoon. Outside of the reef, two easily accessible spots can be seen on the map that is great for waves. The easiest wave spot is located in front of Nosy Toreky Islet: these 1 to 2 meters waves rise at low tide with a side onshore starboard wind. The longest and most renowned wave spot is located behind the Nosy Suarez Islet. A right and 1 to 3 meters wave with a side shore starboard wind. When is the Best Time to go Kitesurfing in Babaomby?